Compared with Cities such as Winchester, York and Chester etc its history is a brief, but nevertheless proud one. Like most boroughs Leamington has its civic insignia and gladly displays this on public occasions. Royal Leamington Spa became a borough in 1875 and the Charter of Incorporation, together with the Grant of Arms made the following year, are now housed in two handsome cabinets presented to the town by the Leamington Spa Courier. The arms of Leamington consists of a shield with a crest above and a motto beneath. 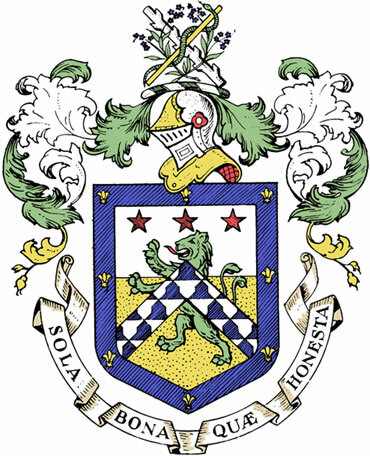 The motto "Sola bona quae honesta" means "Those things alone are good which are honourable", and was chosen by the first Mayor, Alderman S. T. Wackrill who was a draper in Bath Street. The shield is divided into silver and gold portions which represent the two Manors of Newbold Comyn and Leamington into which the parish was anciently divided. The blue and white chequered chevron (Chevron Vair) is a device of the family Fisher of Packington, who owned the Manor of Leamington in the eighteenth century. The three red mullets (stars) are in honour of the Willes' of Newbold and the blue border with the gold lilies is part of the arms of Geoffrey de Clinton, who also owned Leamington and gave it to the Priory of Kenilworth (hence the name Leamington Priors). The helmet is the standard centre piece of any crest and the crossed staves represent the Saxon Earls of Mercia and the medical properties of the spa water respectively. Besides choosing the motto, Alderman Wackrill also presented the chain of office worn by the Mayor and on it are inscribed the names of past Mayors. This chain was made by Mr. R. S. Roberts of 100 The Parade, who also made the mace which was presented by Alderman T. W. Thursfield in 1896. Maces, incidentally, have a very long history. Known in the times of ancient Greece, they were originally the weapons for the protection of civic or other dignitaries. Through the ages these progressed in this role and were to be found in the far East, whilst the Bayeux Tapestry has some figures depicted bearing maces. England has apparently had a weakness for pageantry and the mace gradually evolved until the time of Charles I, when they became standardised to something like the shape one sees today, except for the brief period of Cromwell's rule ("Take away the fool's bauble!") when the orb was replaced by an acorn, and replaced again under Charles II. At the top of Leamington's Mace is Charles's crown ornamented with the Royal Arms on one side and the Borough Arms on the other. At the lower end of the Mace is enclosed a golden sovereign of 1896 and between the upper and lower ends are knobs bearing latin mottoes. One reads "Except the Lord keep the City the watchman waketh in vain" and the other "Do justly, love mercy and walk humbly with thy God". Besides the Mace, Leamington has a magnificent sword donated by Alderman Sidney Flavel in 1905 and has been used for many years to precede the Mayor at the Annual Armistice Parade. One civic jewel which is the envy of every Midland Borough is the Mayoress's Badge, a beautiful piece of work in platinum and diamonds. This was the gift of Alderman Alfred Holt, presented in 1925. Past Mayor's and Mayoress's are now entitled to wear badges indicating their previous offices and each year the presiding Mayor appoints a Chaplain who also wears a badge of office.